Many people would like to enjoy all the delicious foods around the world and energize themselves enthusiastically. 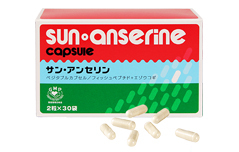 Thus, we recommend these people to take Sun Anserine for a better health. Anserine is usually found in the muscles of many migratory fishes such as tuna and bonito. These fishes need to swim for long distances while maintaining a very high speed. Anserine is also found in the muscles of some birds. Sun Anserine is developed by extracting anserine from wild tunas and bonitos with 99% of purines eliminated (fish peptide), combining with the energized healthy herb—eleuthero, and enclosing in vegetable HPMC capsules for easy consumption. Ingest 2-4 tablets a day with hot or cold water. Swallowing with water is only voluntarily recommended ingestion method however. Ingestion by leaking and chewing is just fine as well.